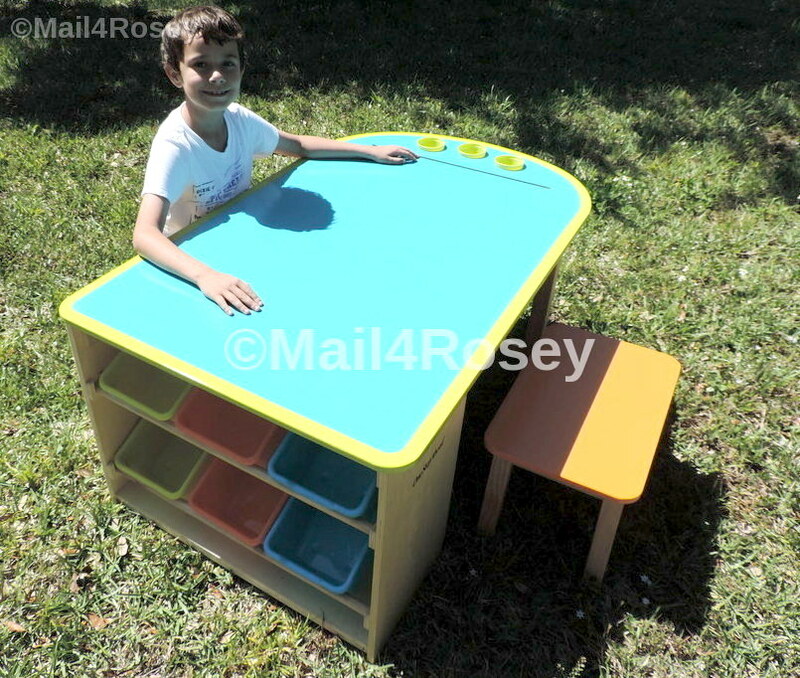 Mail4Rosey: Kids Deluxe Art Table: One Step Ahead has Organizing #Solutions! 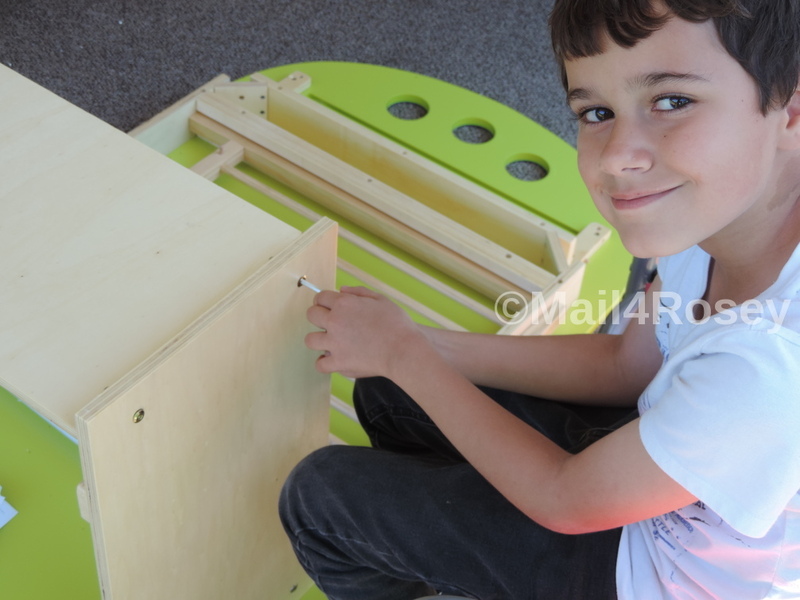 Kids Deluxe Art Table: One Step Ahead has Organizing #Solutions! This is the bottom of the Kids Deluxe Art Table pre-assembled. The tray holds your art work while it's drying. Brilliant! We've got a real organizing challenge around here, most especially with the Legos. My son likes to have several projects running at once, and different little bricks go to different things. Keeping them all organized and in a specific spot can definitely prove space challenging. I don't want to mess with his masterpieces, but I don't want every spot in the house strewn with Legos that could be there for who knows how long until they get used again. One Step Ahead, one of my favorite online stores for finding any and all things related to children, has a solution: The Kids Deluxe Art Table. It's unique and it's fabulous. This is the top of the table pre-assembled. and the slot is for a paper roll (paper included). This is the top of the table. I love the bright colors, they're just cute, cute, cute!! Then, there are three recessed cup holders that hold art supplies or water (for painting), and the slot you see is for a paper roll. The roll hangs under the table and feeds out through the slot. It's a great way to have the table always ready for creativity!! The cups and one roll of paper are included. The table comes with two benches, again I love the bright colors!! My son got to work on assembling these. Once the benches were finished he moseyed on over to help me put together the main part of the table. While we were working, my son was telling me all of the million things he was going to do with this table once it was put together. If you see this brand, you know the product is going to be awesome! One Step Ahead, in case you didn't already know, makes these really cute pieces of furniture that more often than not, are totally unique in some way. This table surpasses any other I've seen for so many reasons! You'll see as you keep reading, exactly what I mean! So we spent about a half an hour putting this together, and we were both absolutely delighted to see it when we were finished! This really is the cutest table I've seen. The tray that pulls out for drying is my absolute favorite feature. We've got quite a few little ones in our family, ranging in age from 1-year-old right on up, so this table is going to get a lot of use. Here is a close-up of the end that has the slot for paper. You can see the three cups, one of the two benches, and the built-in slot feed for the paper. This is how the cups and paper roll (see it behind the cups?) look if you peek your head (or camera) underneath the table. On the other side of the table is the bin storage, or as my son calls it, the Lego storage. ;) We've reserved a few of these for art supplies, but the rest really are filled with Legos. :) That's the beauty of this set. You can use the buckets for anything you'd like, or what is practical for you (or if you're 8, you can wear them on your head ;) ). And those colors!! More with the bold, happy coloring!! This is how the side with the storage containers look when the Kids Deluxe Art Table is all set up (minus the leaf and bicycle tire in the corner. It was a nice day so we decided to build outside). :) Nice, right? That's a lot of storage space for your paints, crayons, markers, etc., and it keeps everything nicely in one place. This is how the table looks unoccupied when it's finished (freshly assembled, still outside on the patio). You can gauge the size visually by looking at the pic. My son is (8), stands 4 ft" and weighs close to 49 lbs. My sister-in-law with her brother's sweet baby girl. The table was definitely a huge hit with the little one, and her sweet baby brother too! And the perfect size for smaller kids too (my niece is 3 and her little bro. is 2-years-old). I know this table it going to get years and years of use. If you're going to make a quality investment this year for the kids' room or work/play area, I definitley recommend this Kids Deluxe Art Table from One Step Ahead. Everything your child's art table should be to inspire creativity (while neatly storing art supplies)! Our rugged wood table is big enough for two kids, with two oversized stools, a spacious two-shelf cubby, and a unique, pullout drying rack. Built-in paper holder, too. Extras include six storage bins, 18" paper roll, and three recessed supply cups. Additional art supplies sold separately. 47"L x 32"W x 21"H. 30-minute assembly required. For ages 3 years and up. You can learn more about One Step Ahead by visiting their website. You can also follow them on Facebook, Instagram, Pinterest and/or Twitter. The assembled piece looks so nice. Your kid is very energetic and helping, not many kids help their parents at home. This table just has everything! I love all of the storage space. The containers are definitely going to be great for Legos. You did a great job with this. It's really cute and functional, too. I agree that you guys did a nice job putting it together. I'm sure it will fulfill many useful purposes. I wish I had space for this table! It looks perfect for my kiddos! What a fantastic table. I want one for myself! It would definitely keep things more organized! The storage is a nice bonus. I love this table! My kids would have so much fun with it! That's a good-sized art table with some very nice features. This is such a cute table and so easy to assemble. It will be the perfect place to write in his journal or play with his Legos. This is an awesome activity table and I like that it has a lot of trays for organization purposes. It's really going to keep kids busy! I'm sure the kids in your home is loving it! Wow, I love how versatile that is. We used to buy so much from One Step Ahead when my kids were younger. Oh my gosh, that's a GORGEOUS art table! My daughter would be in LOVE! She loves art. Love the colors and the station/table! So pretty! So awesome! I love the handy niches and holders for keeping things organised. This is such a good idea. I like the table, it's so cute! That looks so awesome! Love the color and style. Thanks for sharing! I wush we had one of those when my boys were young. I love this table! I love One Step Ahead products and this deluxe art table is pure genius. Madison would love this! We have a table that we got from them a few years ago and it's the one she uses to do her art work on. I might need to upgrade. Love the table! Such a great idea and style. Thanks! That does look like a sweet table! I'm looking for a small desk for a little older kid. It's hard to find one. I might have a venture to Ikea in Kansas City this summer for one. 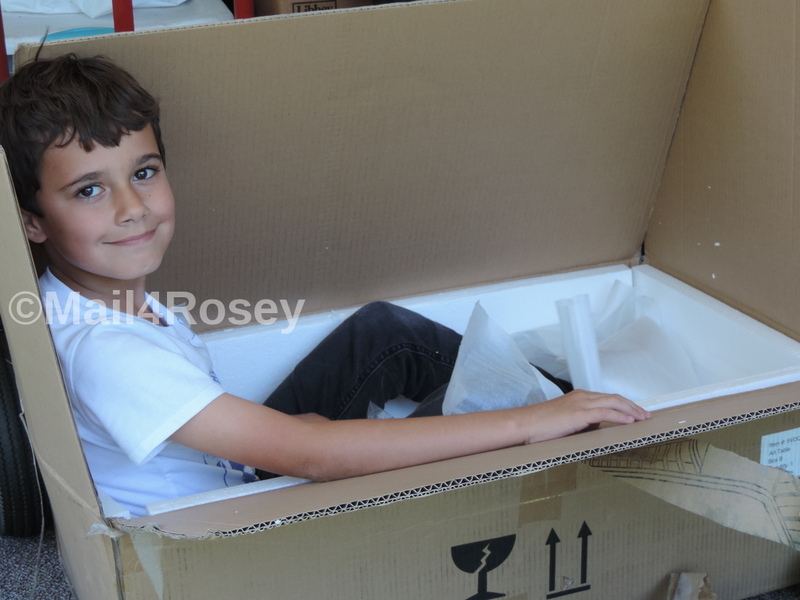 I bet your son and grand daughter are having fun with that big box to. This is really a great functioning table that would be great for me to get for my son and daughter! Look how organized I can be with all their stuff. I like how nice it looks and easy to assemble! This is such an amazing table. Will try to look for this or something like this at the department store soon! That table looks pretty sturdy. It also looks like it would hold a lot of stuff. That really would make for a neater kid's room! This is a great table! My son needs this for his Legos! That looks like a great table. I love those storage bins, and I love the colors. Wonderful. Oh, we totally need this here. He has so many lego creations and gets so upset when he has to move them, he could put them in each box and it be clean. I absolutely love this table/storage! It looks very stable and great use for kids. If only my baby wasn't getting ready to graduate from high school!! What a great table! My arts and crafts obsessed little preschooler would be all over it! This looks like something that would be great for my grand niece! 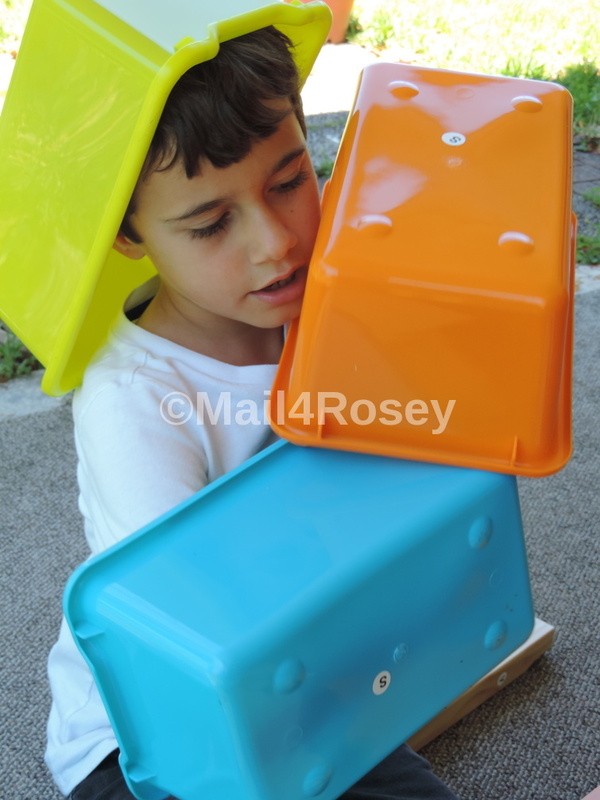 I really love those storage buckets--and they do make good head gear for your 8 year old!! That One Step Ahead art table is amazing. I love the feature of the pullout drying rack. I love the dry racks! Such a cool art table. What a practical table!, my brothers are all about coloring right now, I might try something similar in my house. Such a cute desk. I love how it has places to hang or store their art and art supplies. Very well designed and thought out. This is really nice. The table looks sturdy and durable. The twins will need this for their art supplies. I love this cute little table especially all the little storage areas. Including a place for the paper was genius. This table looks fantastic! I wish I had the room for something like this! What a great table. I really like the drying rack. That table needs to be in my home! How awesome is that! I love this table! I'm going to order one, like right now. We need this! That is one serious art table! I love that it has all that storage! Oh my goodness, I *need* this for my kiddos. Off to OneStepAhead to shop! Thanks for sharing, the storage and huge table surface has me sold! This is an awesome piece to have for a classroom! I love it! One Step Ahead always has such great items for kids. That table is super cool! Love! Love! Love! My favorite part of this table is the paper roll and the drying rack because when I am doing crafts with my grandchildren, those are the two main things that are most difficult to manage. This would be perfect for my daughters room. She loves to craft and we have craft supplies almost everywhere in the house! love that they have fold out drying racks. Perfect for a dayhome too. I really love this table for my son. This is a fantastic craft table. I would have loved one for my craft room when the kids were younger. How great!! This table would keep my Kiddies busy for hours!! I love the different sections and elements all in one great piece! I think teaching children to be organized at an early age is very important. This table is definitely a tool to help foster that habit. A good one to have for my kids. Could be really useful for us! What a handy little table! It has spots for just about everything and is the perfect size for little ones! My son TOTALLY needs that table! I love all the storage space! What an awesome art table!!! I love all the storage and that your oldest can help put stuff together now!! I like toys that the family can put together like your art table fun affair. Oh man this is awesome! I have toddler twins and this would be perfect for saving space and corralling everything they have! That's a pretty cool table, but I'll just take the cute kid. Smiles. Your boy looks extra adorable in the first photo, but I'm good being without child. Have a lovely weekend, Rosey. OOOO now this is an awesome table!!!! My daughter would love it! Oh This is such a cool table! Now I want one for my kids! I love that there's added storage bins! They can store their craft supplies in them! What a great art table. My niece would LOVE this. I love the bright, vibrant colors of the table. I love the paper roll and drying rack that is one freaking cool art table! I love this table/storage! It looks very stable and great use for kids! Love the colors too! The Kids Deluxe Art Table looks so comfy & Yes, the bright colors looks absolutely amazing. I just love how good it looks when all is setup properly & I would one such for my kids. That table is really cute! My sister will love this. Wow! They got everything covered. I must say that I am impressed. We love One Step Ahead products! We got hooked when the kids were babies. I love that table. My son is an avid artist and could really use this space to create freely! Cute Photos! This is a wonderful table and organizer. I would have loved this when my kids were that age. I love this art table! The colours are so fun and it looks very sturdy and well made. This looks like a wonderful piece of furniture and could be used for so many different activities. I love how bright and colorful everything is too! I love it! Awesome photos :) I'm sure any kids will enjoy anything that they're doin when at this desk. My niece would have loved this when she was younger. Even then she loved doing art projects & this would've been great.